Can't get to the sea shore as often as you'd like? Well, how about we bring the sea shore to you. 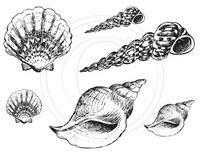 Here's an awesome stamp set of sea shells. Coordinates with our Aqua Sea Shells paper line.